Winner of the 1999 Honor Award for Excellence American Institute for Architects - Kentucky Chapter. The African Outpost Restaurant is an 11,000 S.F. multi-purpose facility located at the end of the African Savannah exhibit at the Louisville Zoo. The primary program components consist of a small gift shop, commercial kitchen, serving area, dining areas, staff offices, and public restrooms. To maintain the African village theme, the design includes natural thatch roofs with wide overhangs supported by heavy, timber eucalyptus poles and walls painted with tribal motifs. Three traditional African rondavel peaked-roof forms break up the scale and maintain the sensation of an African village. 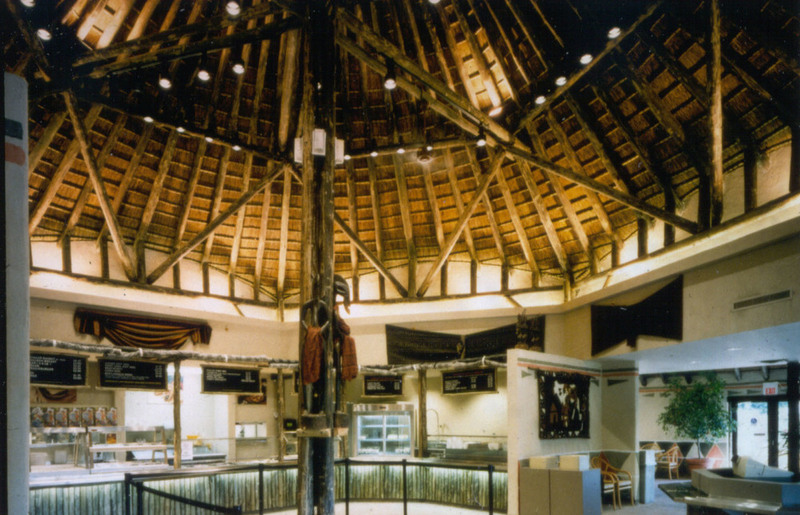 The Boma animal contact area and the molerat/meerkat exhibits that have the same roofing materials further develop the context. Arrasmith, Judd, Rapp provided design and construction administration services. • The sequence of animal rotation simulates the way that these animals live in the wild and emulates the food chain inherent in the Indonesian wilderness. • Changing the species in the various habitats provides the visitor with a new and different experience during each visit to the Zoo. The architectural style of the viewing buildings creates an Indonesian village atmosphere, in keeping with the Island’s theme. The view buildings are organized around a common area to recreate the village environment. The heavy timber, cedar post and beam constructions are suggestive of the traditional framing techniques incorporating rough-hewn logs gathered from the forest. Glacier Run is a town on the edge of the wilderness. This story line is reinforced through a series of marine habitats for seals, sea lions, polar and grizzly bears emphasizing their fragile status that extends their range into a nearby former mining town. The program includes a 108,000 gallon seal and sea lion pool with demonstration area & amphitheater, bear pool and habitat, underwater viewing of both bears and seals / sea lions, overhead bear bridge linking two rotational habitats, view buildings, classroom and gift shop. 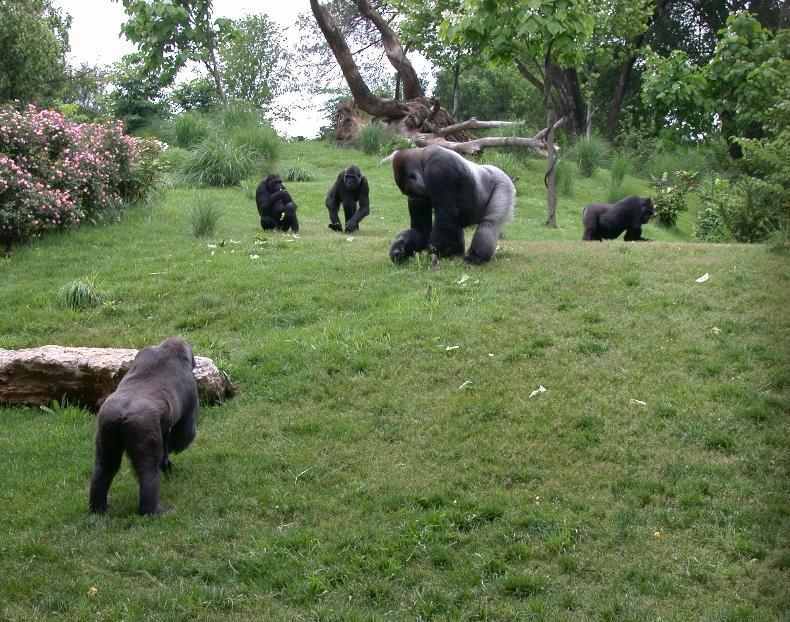 The Gorilla Forest project houses 8-12 western lowland gorillas and two pigmy hippos exhibited in a series of indoor / outdoor habitats, within a 3-acre site. Eight buildings are strung along a meandering pathway for guests to view the animals from various vantage points along the way. Underwater hippo viewing and gorilla rotation through holding, indoor and outdoor facilities are featured. Arrasmith, Judd, Rapp, Chovan, Inc. provided design/build architectural and engineering services in conjunction with zoological consultant CLR Design’s masterplan.